My favourite part of the summer harvest season is eating through all of the different types of fruits. The beginning of summer (whether the Vancouver weather knows it or not) means strawberries in June, to be followed by raspberries, apricots, cherries, plums, peaches, nectarines, and blueberries through the months of July, August and September. The simplest and purest way to eat the sweet local fruit is unadorned and out of hand, but I love baking with it too. Usually I end up putting them into a pie or tart but I was looking through my cookbooks for something more interesting and found an Apricot and Buddha’s Hand Financier recipe in Pierre Herme Pastries. Often when I’m cooking, I’ll use the recipe as a baseline and adapt it to the situation at hand. The recipe called for apricots but I had just bought a bunch of blueberries from the farmers market, plus I love the combination of almonds and blueberries. Lemons are a staple in my kitchen so I used that instead of sourcing a Buddha’s Hand citron. A few spices and a generous dash of vanilla never hurts either. While the original recipe called for multiple components, I decided to just make the almond topping but in a modified form. The chopped almonds were combined with some leftover egg/butter/sugar mixture from a previous baking project from Dorie Greenspan’s Baking From My Home to Yours. The experiment was a delicious success and I’ll make it at least once more while blueberries are in season. After that I think I’m going to try it with autumnal fruits such as apples and pears. Set the oven temperature to 350F. Generously butter and flour a 9” tart or cake pan with a removable bottom. Place the pan on a baking sheet lined with parchment paper. If the almonds are untoasted, bake them in the 350F oven for 5-6 minutes and allow them to cool before chopping them. Melt the butter in a small saucepan over medium low heat. Continue to heat until the water has bubbled away and the milk solids have started to turn a nutty brown colour. Set the butter aside to cool. While the butter is cooling, prepare the rest of the cake batter. Sift the icing sugar into a large mixing bowl. Add the pastry flour and use a whisk to combine them together. Mix in the ground almonds and lemon zest. Stir in the egg whites and brown butter and mix well to incorporate. Add the cinnamon, ground ginger, vanilla and salt and mix again. Pour the batter into the prepared baking pan. Stir the blueberries together with the cornstarch until the blueberries are evenly coated. (The cornstarch will help to thicken the juices as the blueberries bake but this step can be omitted if cornstarch isn’t at hand.) Scatter the blueberries evenly over the cake batter. While the cake is baking, make the almond topping. Whisk together the melted butter, sugar, egg, vanilla and salt in a bowl until smooth. Stir in the chopped almonds with a rubber spatula. 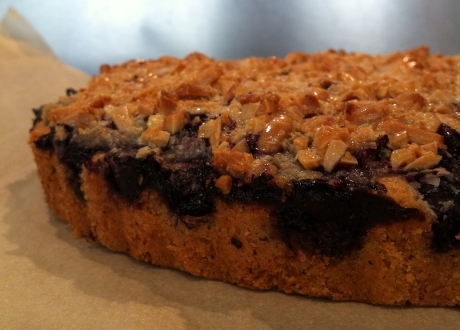 When the cake is done its initial bake, remove it from the oven and spread the almond topping on top of the blueberries. Start spreading the filling from the center and work your way out, leaving the last 1” of cake uncovered. The filling will spread further as it bakes in the oven. Bake the cake for an additional 12 minutes, rotating halfway through the baking time. The almond topping should be a light brown colour and its surface should be baked dry. Allow the cake to cool on a wire rack for at least 15 minutes. Run a very thin knife along the edge of the cake to loosen it from the side of the pan. Cool the cake for at least another 30 minutes before unmolding. Serve warm or at room temperature with a scoop of vanilla or berry ice cream. Note: This recipe should be easily adaptable to other baking nut flours (i.e. hazelnuts, pecans, pine nuts) and a variety of fruits. For juicier fruits (i.e. peaches), toss the fruit with additional cornstarch. I can’t wait to try this cake!